This is a straight-up piece of autobiography about growing up with, struggling through, and eventually facing down the horrible beast that is eating disorders. From early power-struggles at the dinner table we see the seeds of future maladaption sown and though, yes, hindsight is a smug old bugger, it did make me wonder anew at some of the things adults say to children; things which may seem 'normal' or even helpful at the time but which can prove to be anything but. We follow Katie as she grows up, transitioning from child to 'young woman', going up to high-school, then to University, becoming ever more aware of the expectations of the world around her. As the pressure grows and she feels less and less sure of herself we watch her turn food into a control mechanism; something to be regulated and rationed, an area of perfect clarity in a life of constant, bombarding change. Very quickly that 'control' becomes habitual, involuntary and all-consuming and the consequences change from nagging at the table to trips to the hospital. Through her ups and downs (of which there are many) we see Katie come so close so many times to putting her finger right smack bang on the problem. She's not a fool, we can see that she is intelligent and is putting a great deal of thought into her position and her problems, but time and again she is unable to reconcile her rational understanding of what she is doing with the ingrained, deeply woven patterns of behaviour that she just can't help but follow. I think you'll agree you don't have to have an eating disorder to recognise that particular human trait. 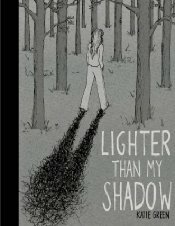 In terms of comicbook craft and storytelling LIGHTER THAN MY SHADOW is absolutely bare-bones. The story is linear, factual and reads like a cross between a memoir and a diary. There are a few recurrent symbolic themes: the ever-present black cloud, the body which peels or poofs away into oblivion, the head-splitting internal voices; but mostly the cartooning is very straightforward and literal. There's nothing ground-breaking or stunning in the art or the approach to the material, rather it is the story itself and what it tells us about an all-too-common struggle that kept me reading.